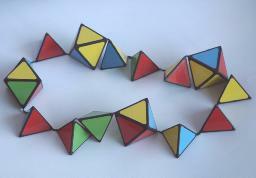 The Pyrix puzzle consists of a loop of string onto which are threaded four octahedra and 11 tetrahedra. All the triangular sides of these shapes have a coloured sticker, in one of the colours red, green, yellow or blue. The aim is to put the pieces together so that they form a large tetrahedron where each side has a unique colour. There is also a second challenge, namely to form a tetrahedron with kind of checkerboard pattern on each face. The yellow face will have three green triangles in it, the red side three blue triangles, the green side three red triangles, and the blue side three yellow triangles. The diagram below shows the arrangement of the pieces on the string and the colours of their faces. The string is short, so that there is no more than one or two millimetres between the pieces, and therefore the corners where the string connects two adjacent pieces will obviously have to (nearly) touch each other in the solution. This restricts the movement a lot, and makes it an easy puzzle to solve theoretically, but hard to solve physically. Sometimes it is more a dexterity game than a puzzle. 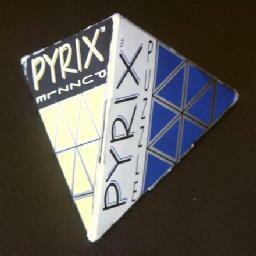 Pyrix was manufactured by Enpros Novelty Products. It was invented and patented by Jan Essebaggers and Jaap Koops, 28 April 1992, US 5,108,100. Below are diagrams of the two solutions. Use the diagram of the loop above to find out what letter each piece is given, and use those letters in the diagrams below to figure out which piece is which. Oddly enough, the two solutions are nearly mirror images of each other.